As one of the larger authorized independent dealers of Benjamin Moore Paints in Orange County, Fullerton Paint & Flooring carries an extensive collection of their premium architectural paints and coatings. An innovator of high performing paint, stains, and finishes since 1883, Benjamin Moore serves up a large palette of authentic colors that resonate with our customers. We carry thousands of Benjamin Moore colors and can accurately mix custom colors upon request. Feel free to bring in a color swatch, chip, or just about anything, and our staff will work to achieve an exact match. Our complete line of Benjamin Moore colors will inspire decorating ideas and help you complement existing color themes in your home or business. Benjamin Moore paints, coatings, and stains are backed up with 25-year to lifetime warranties, depending on the product. Browse our collection of Benjamin Moore paints, stains, and coatings when you visit our 5,000 sq.ft. 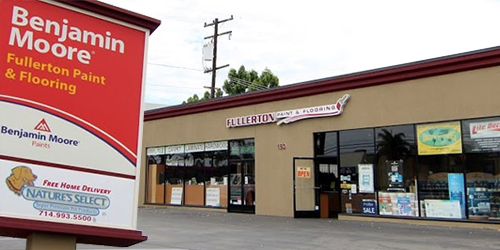 facility and showroom in Anaheim, or if you know exactly what you want, call ahead to place an order. We can deliver or ship our Benjamin Moore paints anywhere in Yorba Linda, Placentia, Brea, Orange, Fullerton, Anaheim, and surrounding cities throughout Orange County. In addition, as part of the Benjamin Moore family of brands we carry Insl-X products which include specialty coatings like traffic paint, pool paint, dry erase and cabinet coat.